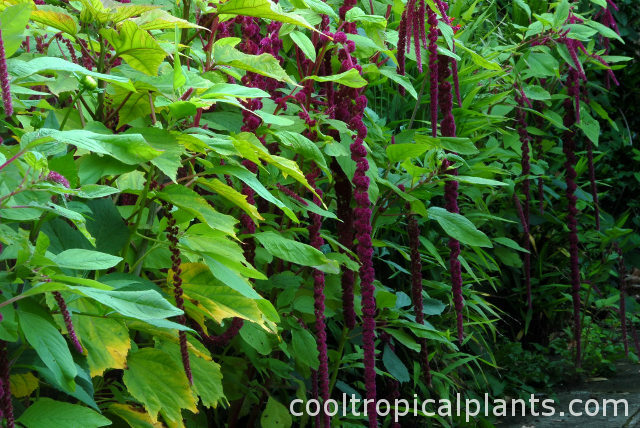 Flowering plants can be used to spice up the cool tropical garden. A splash of colour here and there enhances a garden that relies predominantly on foliage for its effect. One of the great characteristics of tropical plants is that they keep growing all season. Damage caused by snails for example will soon be hidden by newer foliage. Compare this with Hostas, once they sustain snail damage you are left with an ugly plant for the rest of the season. Ideally any plant selected for its blooms should also have these characteristics. There are many attractive tropicalesque herbaceous plants but unfortunately the flowers don't usually last all that long. Combined with this, they also tend to go into gradual decay once flowering is over and seeds are set. Combining herbaceous perennials amongst your tropical plants will lead to very scruffy patches within the display. The longer a plant holds onto its flowers, the more forgiving you can be about it's foliage. Anything that blooms for just a few days needs to compensate with its foliage. When choosing flowers for your tropical garden, try to avoid buying plants or seeds that come in mixed colours. They are often cheaper when sold in this manner but chances are, the less attractive colours will predominate. Not only this but mixed flowers give a garden more of a sea-sidey or cottagey look which is probably not what you are after. There is also a huge range of commercially produced bedding plants to chose from. Many of these bedding plants are tropical/subtropical in origin and will flower and look good most of the season. Typically they are inexpensive and come in handy when you are scratching your head wondering what to put in an unaccounted for gap.